Go to original pattern for design DROPS 184-12. 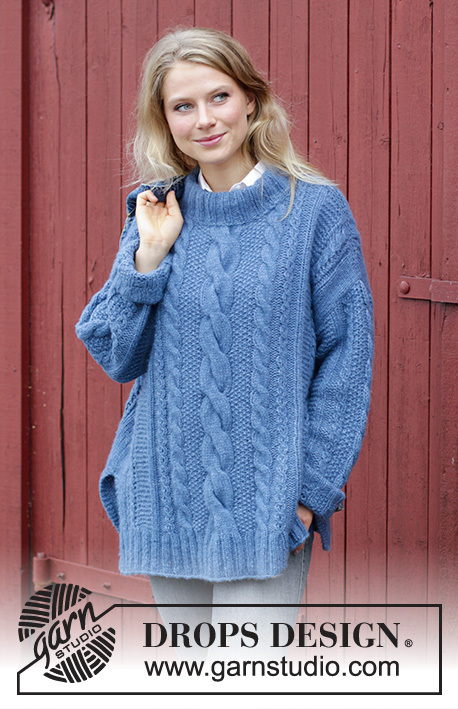 Knitted jumper with cables, lace pattern and split. Sizes S - XXXL. The piece is worked in DROPS Air. 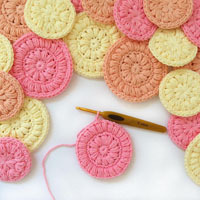 DROPS CIRCULAR NEEDLE (80 cm) SIZE 6 MM – or the size needed to get 15 stitches and 19 rows stocking stitch on 10 cm in width and 10 cm in height. Diagrams A.1 to A.7 measure 52 cm in width on the back piece. 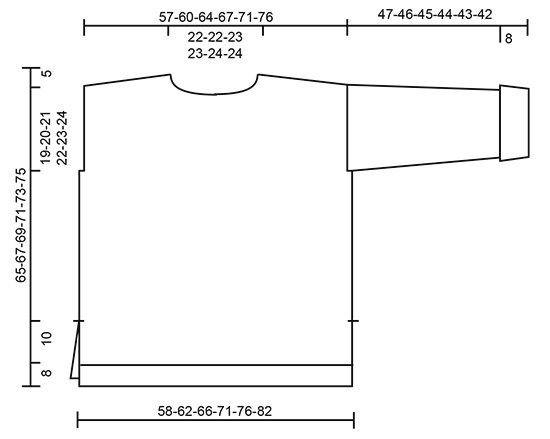 Diagrams A.8 to A.10 measure 19 cm in width on the sleeves. DROPS CIRCULAR NEEDLE (40 and 80 cm) SIZE 5 MM for rib - or the size needed to get 17 stitches and 22 rows stocking stitch on 10 cm in width and 10 cm in height. See diagrams A.1 to A.10. The diagrams show all the rows in the pattern seen from the right side. 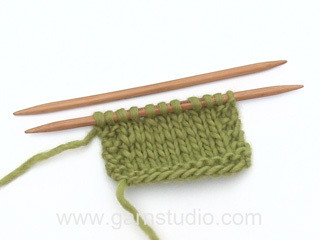 Increase 1 stitch by making 1 yarn over, on the next row work the yarn overs twisted to prevent holes. 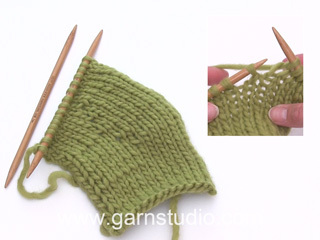 Sizes S, M and L: The increased stitches are worked garter stitch as you go, until there are a total of 6 stitches garter stitch before A.8 and a total of 6 stitches garter stitch after A.10, then work these stitches stocking stitch. 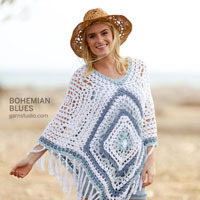 Sizes XL, XXL and XXXL: The increased stitches are worked stocking stitch as you go. The front and back pieces are worked back and forth with circular needle up to the split. Then the body is worked in the round as far as the armholes, when the front and back pieces are worked back and forth separately. The sleeves are worked back and forth with circular needle. The next row is worked as follows from the right side: Work 3 stitches garter stitch, 2-4-10-14 stitches rib as before and decrease 0-0-2-3 stitches over these, work A.1B over A.1A, A.2B over A.2A, A.3B over A.3A, A.4B over A.4A, A.5B over A.5A, A.6B over A.6A, A.7B over A.7A, work 2-4-10-14 stitches rib as before and decrease 0-0-2-3 stitches over these and 3 stitches garter stitch. When A.1B-A.7B have been completed there are 102-106-114-120 stitches on the needle. The next row is worked as follows from the right side: Work 3 stitches garter stitch, 2-4-8-11 stitches stocking stitch, A.1C over A.1B, A.2C over A.2B, A.3C over A.3B, A.4C over A.4B, A.5C over A.5B, A.6C over A.6B, A.7C over A.7B, work 2-4-8-11 stitches stocking stitch and 3 stitches garter stitch. There are now 102-106-114-120 stitches on the needle. Continue this pattern until the piece measures 18 cm in all these sizes. Lay the piece to one side. The next row is worked as follows from the right side: Work 3 stitches garter stitch, work 5-9 stitches rib as before and decrease 1-0 stitches over these, work A.6C (= 11 stitches), work A.1B over A.1A, A.2B over A.2A, A.3B over A.3A, A.4B over A.4A, A.5B over A.5A, A.6B over A.6A, A.7B over A.7A, work A.2C (= 11 stitches), work 5-9 stitches rib as before and decrease 1-0 stitches over these, 3 stitches garter stitch. When A.1B-A.7B have been completed there are 128-138 stitches on the needle. The next row is worked as follows from the right side: Work 3 stitches garter stitch, work 4-9 stitches stocking stitch, continue A.6C (= 11 stitches), A.1C over A.1B, A.2C over A.2B, A.3C over A.3B, A.4C over A.4B, A.5C over A.5B, A.6C over A.6B, A.7C over A.7B, continue A.2C (= 11 stitches), work 4-9 stitches stocking stitch and 3 stitches garter stitch. There are now 128-138 stitches on the needle. Continue this pattern until the piece measures 18 cm in both sizes. Lay the piece to one side. Cast on and work as for the back piece. Place the 2 pieces together on the same circular needle size 6 mm = 204-212-228-240-256-276 stitches. Insert 1 marker in each side and allow the markers to follow your work upwards. Continue by working in the round over all stitches as before, but the garter stitches in each side are worked in stocking stitch from here. When the piece measures 41-42-43-44-45-46 cm - adjust so that the next round is a round without yarn overs in the diagrams, decrease 2-2-4-6-8-10 stitches in each side (= 1-1-2-3-4-5 stitches on each side of each marker). Front and back pieces are now continued separately. ROW 1 (= from right side): Work until there are 6-6-6-7-7-8 stitches left on the needle (towards shoulder), turn and tighten the strand. ROW 2 (= from wrong side): Work until there are 6-6-6-7-7-8 stitches left on the needle (towards shoulder), turn and tighten the strand. Repeat rows 1 and 2 three more times: work until 6-6-6-7-7-8 stitches more remain on the needle than on previous row from the same side, turn (= 6-8-10-8-10-10 stitches left on the shoulder). Work 1 ridge over all the 30-32-34-36-38-42 stitches, cast off. When the piece measures 62-64-66-68-70-72 cm decrease 3 stitches over each cable of 6 stitches and decrease 7 stitches over the cable of 14 stitches. When the piece measures 63-65-67-69-71-73 cm cast off the middle 25-25-27-27-29-29 stitches for neck and each shoulder is finished separately. Cast off 1 stitch on the next row from the neck = 30-32-34-36-38-42 stitches left on the shoulder. Work the other shoulder in the same way. = 100-104-110-114-120-128 stitches. Continue in the same way as the back piece until the piece measures 59-61-63-65-67-69 cm. Now decrease 3 stitches over each cable of 6 stitches and decrease 7 stitches over the cable of 14 stitches. When the piece measures 60-62-64-66-68-70 cm place the middle 21-21-23-23-25-25 stitches on 1 thread for neck and each shoulder is finished separately AT THE SAME TIME as you work diagonal shoulders as for the back piece. Continue to cast off for the neck at the beginning of each row from the neck as follows: 2 stitches 1 time and 1 stitch 1 time = 30-32-34-36-38-42 stitches left on the shoulder. Work 1 ridge and cast off. Work the other shoulder in the same way. 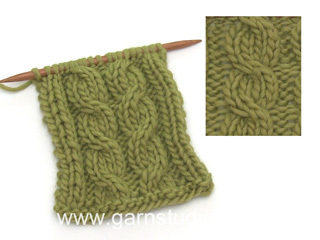 Cast on 42-42-42-50-50-50 stitches (including 1 edge stitch in each side) with circular needle size 5 mm. Purl 1 row from the wrong side. 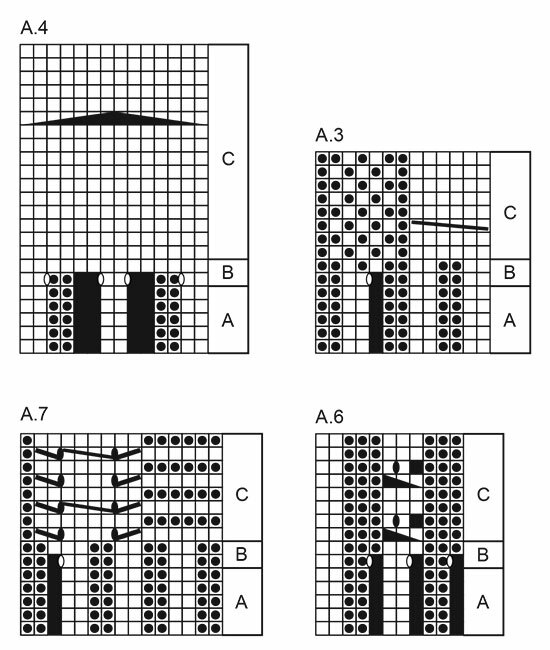 The next row is worked as follows from the right side: Work 1 edge stitch in garter stitch, purl 1, * knit 2, purl 2 *, work from *-* a total of 1-1-1-2-2-2 times, work A.8A (= 12 stitches), A.9A (= 6 stitches), A.10A (= 12 stitches), * purl 2, knit 2 * work from *-* a total of 1-1-1-2-2-2 times, purl 1 and 1 edge stitch in garter stitch. Continue this pattern until the piece measures 8 cm. Change to circular needle size 6 mm. 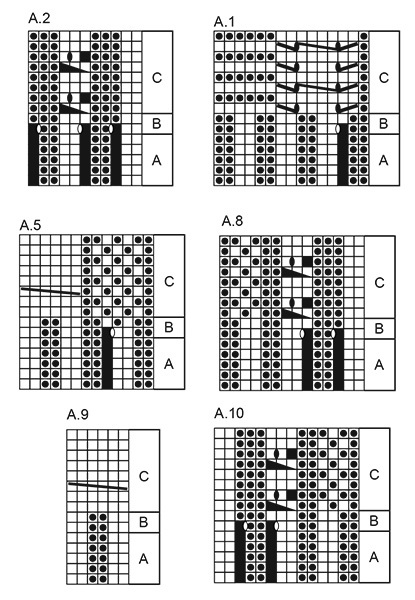 The next row is worked as follows from the right side: Work A.8B over A.8A, A.9B over A.9A, A.10B over A.10A, the remaining stitches are worked as before. When A.8B-A.10B have been completed there are 46-46-46-54-54-54 stitches on the needle. The next row is worked as follows from the right side: Work 1 edge stitch in garter stitch, 0-0-0-3-3-3 stitches stocking stitch, 5-5-5-6-6-6 stitches garter stitch, work A.8C over A.8B, A.9C over A.9B and A.10C over A.10B, work 5-5-5-6-6-6 stitches garter stitch, 0-0-0-3-3-3 stitches stocking stitch and 1 edge stitch in garter stitch. Continue this pattern. When the piece measures 13-15-14-12-15-13 cm increase 1 stitch in each side - read INCREASE INFORMATION above. 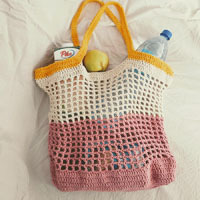 Increase in this way every 4½-3½-2½-3-2½-2½ cm a total of 9-11-12-10-11-13 times = 64-68-70-74-76-80 stitches. Continue working until the piece measures 53-52-51-50-49-48 cm (shorter measurements in larger sizes because of broader shoulders). Now cast off for a small sleeve cap in each side as follows: Cast off 7-7-8-8-9-9 stitches 2 times and cast off 6-8-7-9-8-10 stitches 1 time - decrease 1 stitch over each cable with holes and decrease 3 stitches over the cable of 6 stitches on the last cast off row. Cast off the remaining stitches. The piece measures approx. 55-54-53-52-51-50 cm with the cuff turned up. Work another sleeve in the same way. Sew the shoulder seams inside the cast-off edge so that you get 2 ridges on top of the shoulder. Sew in the sleeves inside the 1 edge stitch in garter stitch. Turn the cuffs up on the right side. Knit up from the right side approx. 74-80 stitches around the neck (including the stitches from the thread in front) with short circular needle size 5 mm. Purl 1 round and adjust the number of stitches to 72-72-76-76-80-80 stitches. 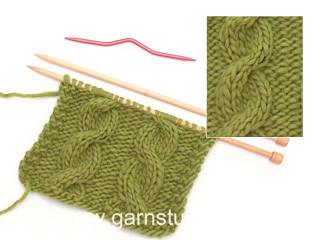 Then work rib in the round (= knit 2 / purl 2) for 10 cm, cast off with knit over knit and purl over purl. Fold the neck double in towards the wrong side and fasten with small neat stitches - make sure the seam is not tight. The diagrams have been updated. After instructions on how to work diagonal shoulders there were 2 instructions on how to cast off. This has been corrected to only include 1: Purl 1 row from right side over all the 30-32-34-36-38-42 stitches, cast off. Diagram A.7 is corrected, so that you cable in front of piece. Lovely pattern but I'm stuck at the diagonal shoulders instructions. I'm doing size L, and I don't understand the sentence "work until 6 stitches more remain on the needle more than on previous row from the same side, turn (= 10 stitches left on the shoulder)" I have 24 stitches on each shoulder, after doing rows 1 and 2 flour times. Puzzled! Dear Chris, when working the diagonal shoulder, you are leaving unworked 6 sts more at the end of every row: at the end of 1st row there will be 6 sts left on one side, then on 2nd row 6 sts left on the other side, then 12 sts left at the end of next 2 rows, then 18 sts left at the end of next 2 rows and so on. When all short rows have been worked, 10 sts remain for shoulder. Now work 1 ridge over all stitches (also the one left unworked for the short rows). At the same time, you will shape neckline (decrease sts and cast off the middle stitches + 1 st towards neck). Happy knitting! Könntet ihr bitte die Anleitung korrigieren: am Ende der Beschreibung für das Rückenteil fehlt der Hinweis auf die Krausrippen, dies konnte ich mir nur aus der Anleitung für das Vorderteil erschließen. Herzlichen Dank für alle tollen Anleitungen! Hej. Diagram A7 viser over 4 felter en skrå streg, der går nedefra og op. Jeg kan ikke se i symbol forklaringen, hvad der skal strikkes. Jeg kan kun se i symbol forklaringen hvad der skal strikkes hvis stregen går oppe fra og ned. Bij A1c moet ik (volgens mij) bij de kabels een omslag maken en dus steken meerderen. Die nieuwe steken zie ik niet in het telpatroon terug. Bij A2c zou ik van 3 naar 1 steek moeten minderen, en op de volgende 1 steek door omslag vermeerderen., maar dan kom ik steken tekort. Ik vermoed dat ik iets over het hoofd zie, kan je mij helpen? Bij A.1c maak je inderdaad 2 omslagen, maar je mindert ook 2 steken (schuine streepjes), waardoor je weer op het zelfde aantal steken uitkomt. Bij A.2c minder je 1 steek: van 3 steken naar 2 steken (de afgehaalde steek over de 2 gebreide steken halen) en op de volgende naald maak je een omslag, zodat je weer op het zelfde aantal steken komt. Hej, Jeg forstår ikke afsnittet omkring skrå skulder: der står, at man skal strikke frem til der er 6 m tilbage på p, og derefter vende og gøre det samme på næste p, men hvis man så skal gentage disse to pinde 3 gange, vil man så ikke vende det samme sted hver gang, altså med de 6 m tilbage på pinden? Det giver vel et stort hul, når man så strikke en p vrang til sidst? Håber, I kan hjælpe. Hei Ditte. Du strikker til det gjenstår 6 masker mer enn på forrige pinne, altså du strikker over 6 masker mindre hver gang. Vi har nå lagt dette til i oppskriften. God fornøyelse. Hei! Har et spørsmål ift diagrammet. Siden det strikkes frem og tilbake, viser F. Eks andre og siste rekke i B diagrammene hvordan en skal strikke vrangsiden? Eller viser den neste pinne som skal strikkes fra rettsiden? Hei Stina. Diagrammene viser hver pinne i mønsteret, men sett fra rettsiden. Det vil si at når du strikker fra vrangsiden må du strikke omvendt av det som står. Altså du strikker fra venstre mot høyre, i tillegg til at rett strikkes vrang og vrang strikkes rett (dette står også forklart i symbolforklaringen). God fornøyelse. Jeg kan slet ikke finde ud af jeres afsnit med hals og skulder. Begge steder står der, at skal lukkes af. Det ene sted står det at der skal strikkes en pind vrang fra retsiden. Det andet sted skal man strikke to pinde retstrik og så lukke af? Jeg er forvirret. Kan forklare det? Hei Connie. Her var det visst kommet dobbelt opp med instruksjoner. Dette har nå blitt rettet, du skal felle av etter en pinne vrang fra retten. Takk for beskjed og god fornøyelse. Hei Det står henvist til diagram A1 - A10? men det er bare 6 diagrammer? Jeg ser det står at diagrammer er oppdatert, men jeg kan ikke finne disse? Hei Berit. Under BAGSTYKKE, står hele forklaringe på hvordan vrangborden/de første 8 cm skal strikkes. F.esk i str S. Slå 88 masker op på rundpind 5. Strik 1 pind vrang fra vrangen. Næste pind strikkes således fra retsiden: Strik 3 masker RETSTRIK - se forklaring over i oppskriften, strik 2 ret, * 2 vrang, 2 ret *, strik fra *-* totalt 0 gange, A.1A, A.2A, A.3A, A.4A, A.5A, A.6A, A.7A, * 2 ret, 2 vrang *, strik fra *-* totalt 0 gange, strik 2 ret, 3 masker retstrik. Fortsæt dette mønster til arbejdet måler 8 cm. God Fornøyelse!